PARKER PM146 Series 2/2 N/Closed Direst Operated Valves. The Valve Body is made of Brass. Seals available is NBR. The Operating Pressure Range depends on the Coil and orifice size. 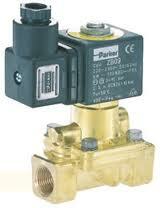 PARKER PM133 Series - 2/2 N/Closed Pilot Operated Diaphragm Valves. The Valve Body is made of Brass. Seals available is NBR, VITON and EPDM. The Operating Pressure Range for 1/2" to 1" is 0,1 to 20 Bar. The Operating Pressure Range for 11/2"" to 2" is 0,1 to 10 Bar. 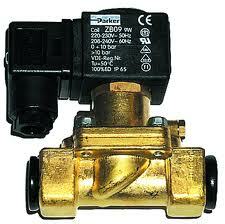 PARKER 7321 Series - 2/2 N/Closed Pilot Operated Diaphragm Valves. The Valve Body is made of Brass. Seals available is NBR, VITON and EPDM. The Operating Pressure Range for 1/2" to 1" is 0,1 to 20 Bar. The Operating Pressure Range for 11/2"" to 3" is 0,2 to 10 Bar.